The Lord has impressed this author to write a booklet (which may turn into a book) corresponding to a long time and continuing detailed study of the word of God covering principles, dispensations, and covenants in the Bible. This study may look at some other teachings, but all such teachings will be compared to what the Bible literally says from Genesis to Revelation concerning the particular principle, dispensation, or covenant each of which will occupy its own chapter or chapters (to be determined as this booklet is penned). The author will not present finished chapters all at once, but will publish each chapter in its beginning and as it progresses. Understanding these matters should be near the top of any serious Bible study since correctly dividing the word of truth on them is necessary to a solid understanding of Scripture, of the history of the church including the history of the persecution of authentic believers, and of the daily spiritual battle that all believers are instructed to engage in. Knowing the history of the persecution of believers is important; knowing why they were willing to die horrible deaths for their faith in Jesus Christ is more important since the latter must be based upon the foundation of the word of God. Accurate history and present day fact proves that true believers (as well as heretics, apostates, and followers of false religions) died and continue to die for their faith. Dying for the wrong reason may surprise one when he ends up in hell. Sadly, generally speaking, much study time has been devoted to historical persecution of true believers, but little time to Bible foundations of their martyrdom. This study is open to analysis, but Bible analysis only. It matters not what anyone teaches. What matters is what Scripture teaches on the subject as a whole. For example, the book of Hebrews speaks of the new and the old covenants. Does this mean that there are only two covenants in the Bible. It cannot mean such a thing since there are obviously more than two covenants in the Bible. To understand what Hebrews is teaching, one must first understand if the rest of the Bible describes only two covenants. One must consider to whom is the particular Scripture speaking, for what purpose, and both the immediate and overall Scriptural context. There are definitely numerous principles, covenants, and dispensations in the Bible. After many years of study accompanied by copious notes, the author cannot deny the obvious. The author has always looked at Scripture as the standard when reading what others have written or said. The author is aware that good men of God have been led down the road to a belief in what is called “Covenant Theology” by studying what others have written on the subject and verifying what they have been taught by looking at the Bible. In trying to convince others to believe in covenant theology, men will usually start with verses in the New Testament, taken out of context without a foundational study starting in Genesis 1.1 and ending with Revelation 22.21. They have not started in Genesis with dedicated study and copious notes on principles, covenants, and dispensations. Covenant theologians are not the only ones who have perverted the teachings of Scripture; others such as hyperdispensationalists have done likewise, although in a different manner, maybe even by going through the entire Bible starting in Genesis. This is the way to learn the Bible. This is not the way of the Reformed Covenant Theologian; this is not the way of the hyperdispensationalist; this is the way of the dispensationalist. The Reformed takes the Bible out of order, adds to the Bible, and spiritualizes portions of the Bible to support a false theology. This study starts with covenants. “In theology, the covenant of works, is that implied in the commands, prohibitions, and promises of God; the promise of God to man, that man’s perfect obedience should entitle him to happiness. This do, and live; that do, and die. “The covenant of redemption, is the mutual agreement between the Father and Son, respecting the redemption of sinners by Christ. Notice that the covenant of works is “implied” according to the Covenant Theologian. To correct the above definition of the so called “covenant of works”, the Bible from beginning to end teaches that the God-given goal of man is the glory of God, not personal happiness. The goal of man from the beginning was to glorify God. He did so by obedience. However, there was only one “do not” and only disobeying that “do not” rule brought death: do not eat of the tree of knowledge of good and evil. Genesis 1.16-17. 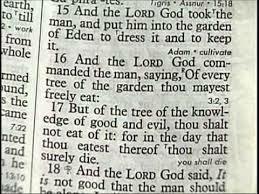 In that first covenant, God gave one rule which would bring death: if man ate of the tree of the knowledge of good and evil, he would die. God commanded man to do certain things. However, man was told not to do only one thing: not to eat or the tree of knowledge of good and evil. Disobedience to that one rule would result in death. How much clearer can the Bible be? How can the Covenant Theologian so misconstrue the word of God and get by with it? One who believes and studies the word of God cannot deny the above truth. As this study progresses, many more fallacies of the Reformed will be revealed. That is enough for tonight, December 15, 2015.